Hear no weevil – iris elsewhere. This is my imaginary friend Chris, 42-year-old karate instructor and second guitarist of the local band Weevil Rock You. He would be ecstatic to know actual weevils are trying to talk to him, but alas, headphones. 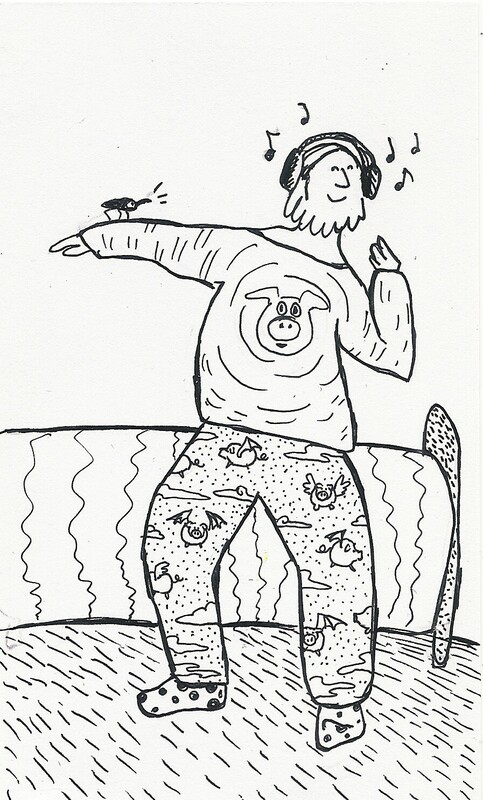 Still, he hasn’t listened to the news either, and has no intention of doing so today -he’d rather just jitterbug in his flying pig pyjamas. I think he’s on to something there. I’d love to know if the band has any original compositions and if so, what are they named, because if the name of the band is any indication, I’ll be laughing a lot. Also, I had eye surgery today, just minor, but I’m still seeing a little crazily, and I thought you said Chris was jitterpigging at first! Oh, I hope you feel better soon! Though I love the idea of jitterpigging, and it would make sense with the jammies. ^^ I am sorry to disappoint you though – both Chris and his band are the products of my deranged imagination, so no songs there… But if you know of any rock bands desperate for a name, do pass it on!